Making a colour chart is a great way to find out what colours you have and will go together. 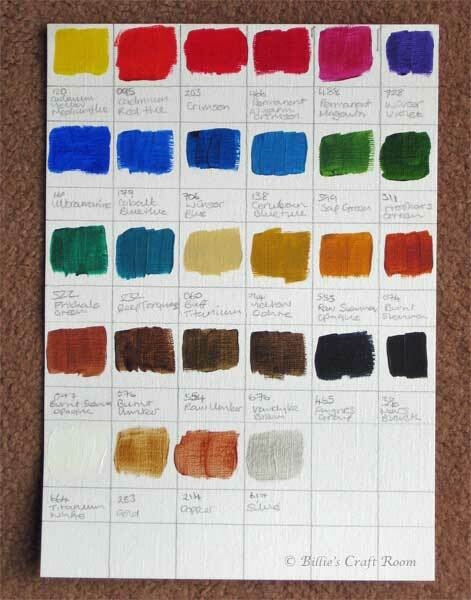 In lesson 2 you’ll do just that, create a colour chart and keep a note of what brand and number each one has, so when you run out of a colour, you’ll know which one to order or buy from your favourite shop. See you next Wednesday for lesson 3. As ever hope you are enjoying the journey and do leave me a comment with any questions. If you are enjoying this free series, show your thanks by telling others on the social networks. 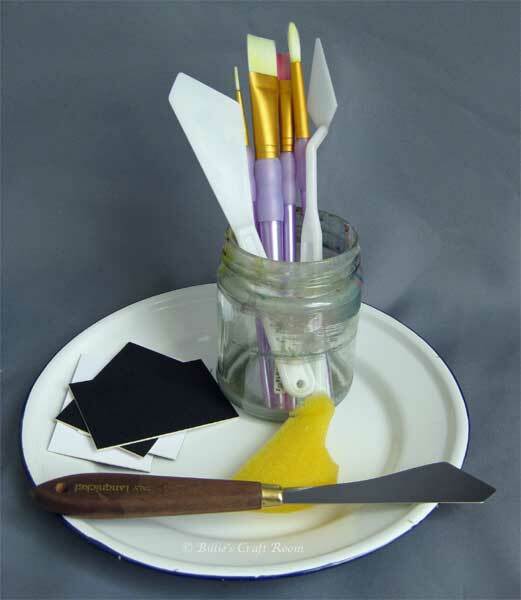 Lots of us want to get into mixed media but don’t know where to start. I hope with this series; to help you find the tools, materials and techniques to get you started on your mixed media journey. This workshop is offered for free because I know how its often a class vs materials kind of deal for a lot of us right now. You can spend quite a while collecting your favourite tools and the last thing you want to do is let them go to waste because you let paint dry on them. Acrylic paint will harden and ruin brushes/pallets and pallet knives, so check out this tutorial to help your tools last longer. Do check back next Wednesday for the next lesson. If you find tips that help, do post on the social media sites, and tell others about this course. Leave me a comment if you have any questions and I’ll try to help you all I can. After sharing a picture of my first marbled print. I wondered if you would like to see how the print was created? 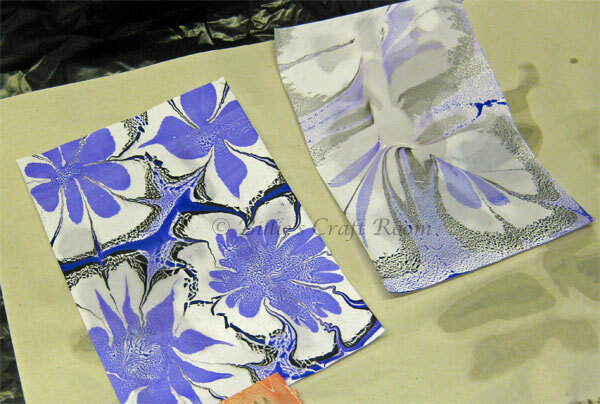 For this tutorial I used the Marbling 4 Fun kit that I reviewed in an earlier post. 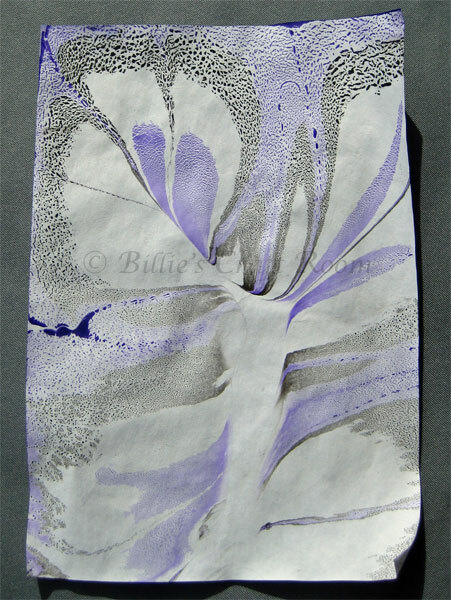 Here is the Marbling 4 Fun video tutorial, for mixing up the floater powder. You need to do this 24 hours before you want to marble, for the mix to set. This is the fluid that the paints float upon. Because I only had a small bowl to mix in and a small bottle to store it in, I used the guide found on the Marbling 4 Fun website that states : 5 grams of floater powder to 1 litre of water. I made up 1 litre of water to the 5 grams of floater powder and it was enough to fill the small tray that the kit comes with. So you don’t need so much storage space if you are only doing small items. To store my floater mixture; I used a clean and empty 2 litre plastic milk bottle, which has a screw top lid. Write on the bottle what it will contain BEFORE you fill it, to ensure there are no accidents with people trying to drink it! You need to leave the mixture at room temperature overnight before you use it. After this stage, if stored in the screw top bottle in the fridge, it can last up to three months. Set up you area to marble in. This is a messy process, I won’t lie, but its also very much worth it. The floater mixture, leaves a coating of what feels like thinned out hair gel, on the surface of the paper/project and it takes a fair while to dry. So you need to plan for where you will put them. Here’s how I set up the area I marbled in. Preparing your workspace to marble in. First I put a layer of plastic over the whole area, these are just bin bags cut along the sides so they lie flat. On the right, you can see a few layers of blank newsprint, this is not expensive and I got mine from a house moving company. This paper is to lie wet pages onto, while they dry. In the end I also added a try under the white box so I had somewhere to put wet tools. Its a good idea to work on a hard floor in case of drips n spills and expect to leave the wet papers overnight if you are working in cold conditions. This was done in February in the UK and they took around 12-24 hours to dry depending on the size of the card/paper, in the unheated studio. Have a bucket to hand to dump the wet waste paper into. Stage 1: Applying the paint to the tray. Here are the paints on the water, before I pulled the print. My first marbling page. Paints on the water. Another drip of purple into the centre of each of the shapes. 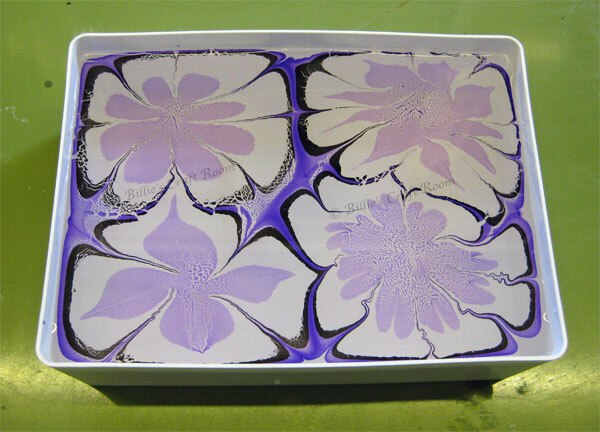 Using the star flower technique, I used a pin to drag ‘petals’ in to the centre of each shape; the flowers with the points, I created by pulling the paint back out toward the edges from each of the purple ‘petals’. I’ll add the star flower video tutorial at the end of the article. Using 80 gsm printer paper, I placed a sheet on top of the pattern in the try, allowed it to sit there a few moments, then carefully peeled it back off to reveal the print. The first generation of print will be bright, the later ones more pastel. Here are the newly printed pages, still wet with the floater mix. First generation marbled paint print on the left and the second generation on the right. Here’s how the pages turned out after drying. My second marbled page. Second generation of paint. Here is Craig Joubert’s video for how the flower pattern is created. I’ll try to make my own videos with marbling, once the light levels improve in the UK. Craig is the maker of the kit and the man behind Marbling 4 Fun. Have you ever tried marbling? How did you get on? Would you like to see more marbling videos at a later date? Let me know in the comments below. Today I’d like to share another doodle I have drawn. This one was created after watching a Shoo Rayner tutorial on You Tube. I used Faber-Castell Pitt pens for the outline and their Polychromos pencils for the colouring. If you are new to the world of doodling and want to learn how to draw a paisley shape check out Shoo Rayners tutorial and channel on You Tube. 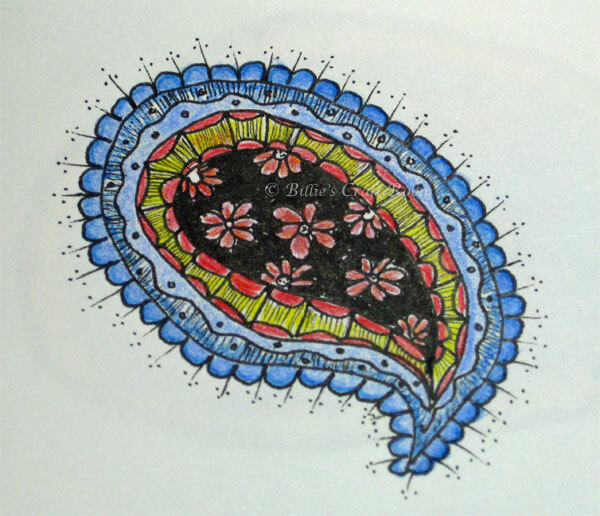 Do give doodling a try, you only need a little notebook and any pen you have to hand, great for waiting rooms or long commutes. Thank goodness for the awesome light DH bought in the Amazon sale, the natural light is far too low to photograph without it. Would you like a more personal Christmas? Less commercial, not so much battling shops n crowds at the last-minute? There is another way, a couple of years ago I started shopping earlier and hand-making gifts. You get to stay in the warm, maybe have your fave movie on in the background and create a gift that the recipient will treasure because you put into it something you just can’t buy..your love and your time. Today I’d like to share some links to projects and ideas that would make great Christmas gifts created with fabrics, some will take more time than others but most will be achievable to everyone, even those very new to sewing. These take very little fabric and would be great extra gifts and ideal for little uns too. Easy to sew Pyjama trousers. Sneak a pair of your recipients fave pj trousers and recreate them in the new fabric. A great gift for women of all ages, I’d overcast the edges for a more long-lasting result but a handy stash busting last-minute gift. Are you fed up with the nylon and velour tree skirts available in the shops? 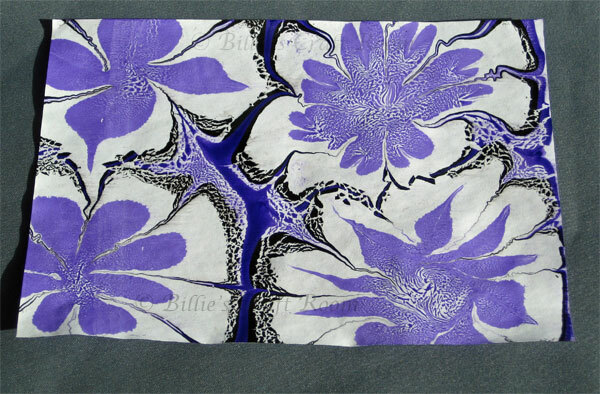 Why not create your own to match your decor in quality fabrics. Love up your tree with this great project. This is a great project for the girls but alter the fabric and colours to make a wash kit bag for the boys or the size to make a pencil-case for the kids. Ahh kids (of all ages) today are so in love with technology aren’t they. How about creating a little softness in their world with some amazing fabrics you can make this laptop cover. Alter the size and it could also work for a tablet or e-reader too. If you want to include your own designs or images in your projects, you can buy printable fabric from Crafty Computer Paper. How about making T-shirts with your fave pics on, or tote bags with your kids or pet pictures on. Opps got a bit carried away again, but hopefully there is something for everyone on your list. I would love to know if you make something handmade this Christmas and do share a picture if you do. 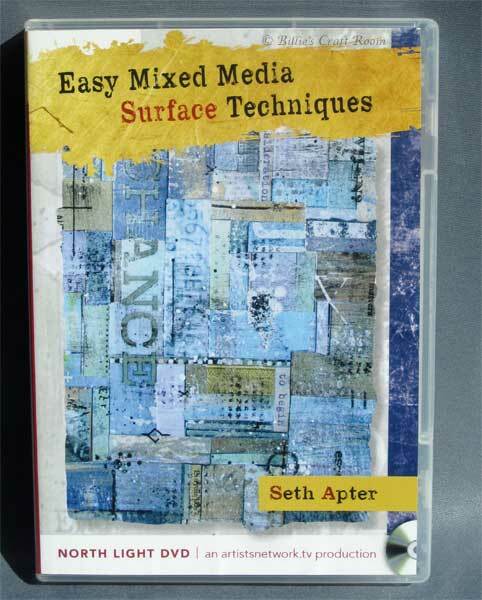 In today’s post I will be reviewing; Seth Apter’s Easy Mixed Media Surface Techniques, DVD. Having read Seth’s blog; ‘The Altered Page’ for several years now, I already liked his style of art. A trip to America to take a class with him is beyond my budget so when I heard he had DVD’s out, I jumped at the chance when I saw one of them on Amazon. Please note if you are in Europe that this DVD is in NTSC format not the European standard PAL. Personally I haven’t got any, I saw some reviews on Amazon saying it was a bit basic but the clue is in the title ‘Easy Mixed Media’. This is a great DVD for picking up new ideas and ideal for newbies too. Excellent, easy to navigate to individual sections if you wish too and very watchable beginning to end. Excellent, like taking a one to one workshop with Seth. Yes, I love Seth’s artistic style and his tutorial style is encouraging, empowering and reassuring, which is great for those who would like to create more but are bewildered by the wealth of mixed media materials out there. Love this DVD, I learnt a lot of new techniques, and had lots of ideas for adapting them to my own style rather than the sort of tutorial where you can only create the project as shown. This to me is the mark of a good tutor. Nice job Seth, and since streaming video seems to be beyond my current internet connection this DVD was ideal for me. If you are in Europe, bear in mind this DVD is in NTSC format not PAL, that European countries use. The DVD is a region 0 disc though, so you need to check what your own DVD player will handle. Have you been longing for a sewing machine? Perhaps you have a budget in mind or the family have started asking what you would like for Christmas or your birthday. Rather than individual presents, maybe they would be interested in going in together, to help towards the cost of your dream machine. Ohh the possibilities, so how do you choose which machine is right for you? Read on for helpful tips to narrow the search. There are so many options, how do I choose which machine is right for me? Here are some helpful questions to ask, to help you narrow the choice. 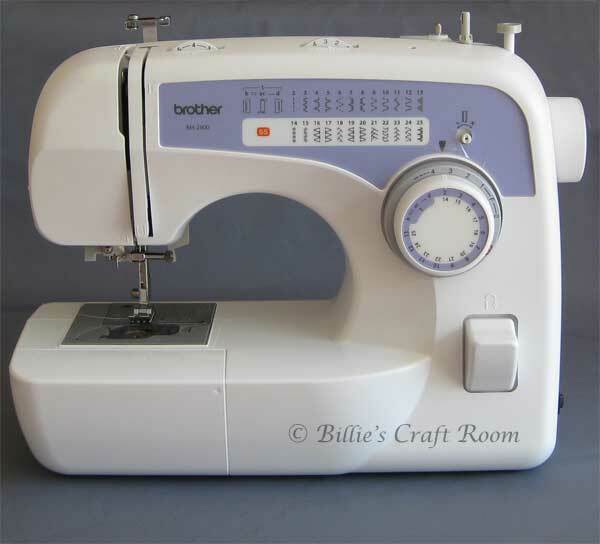 What would you like to use the sewing machine to make? If this is your first machine, pretend for a moment that you can afford anything, and already know how to sew anything that comes into your mind. Now write a list of all the things you would like to create with your new machine. You now have this list it will help lead your choice as some machines are better for some jobs, than others. For example if you mainly want to do a few clothing repairs and have the option of trying some craft style projects, then you don’t need huge numbers of stitches. Machines with fewer stitches are often cheaper and you could get a much better quality machine with fewer stitches than for the same budget if you wanted lots more stitch options. If you are thinking more home furnishing, curtains etc then you will be using much heavier weights of fabric, so go for a sturdier machine whose motor can better cope with these things. Now that you have your dream list of things you would like to create with your machine, have a look at some of the main manufacturers of sewing machines and what is available. When you see a machine you like, download the manual to see how easy/difficult the machine looks like it will be to use. Not all shops or online retailers have much information about individual machines so getting hold of the manual is a good way to compare machines and find out just what they are capable of. It will also let you discover what comes in the box and hopefully what other accessories and feet are available for that machine. There will be a selection of feet that come with your machine, how many there are is likely to be driven by your budget and which machine you choose. With your dream list of projects, have a look to see what feet are needed for those kinds of project and check their pricing. The last thing you want is to discover in a years time is that your great bargain can’t grow with you as there aren’t more feet available so now you can’t do half the projects you had planned, or the feet to make it do so, are prohibitively expensive. You have a choice, buy a basic machine with the full intention to learn the ropes on it and expect to trade up to a bigger better one as your skills improve or by doing some research that I’ve mentioned above, getting a little more expensive machine, that will give you the option of adding extra feet as your sewing horizons expand with your confidence. One thing I can promise you, is that if you get bitten by the sewing bug, you will be astonished at how quickly you want to do more than you ever imagined when you first bought your machine. When I bought mine, I ‘just’ wanted to make bags, perhaps alter a few hems. Three years later and I’m now very keen to try dressmaking, nothing earth shattering but being short I find trousers almost impossible to buy to fit. I like cotton skirts but often their prices are painful, I’d like to try to make some of those too. Now I’m not saying making your own clothes will be cheaper, sometimes it will, sometimes it will cost the same, and sometimes it will cost more BUT it does give you more options for colours, fabrics and styles that YOU choose, not what the shops say you should want. If you have friends or family that sew, see if you can use their machine and ask them what they love or hate about it. If this isn’t an option check out the many sewing forums online and see what machines people on there are using, ask questions and have a natter. Better to do this now, than to drop a load of hard-earned cash on a machine, that in three months you regret getting. Now I know this sounds a bit daft, but do spare a thought for what you will do with your machine, when you aren’t using it. The reason I say this, is because some machines are a lot heavier than others and if you are needing to store you machine away in the cupboard and haul it out when you want to use it, suddenly the weight of the machine could become a big issue. If the machine will be out on a desk, you want to protect it from dust, so check out what covers the machine comes with or if there are bags available for it. If you have the space and funds there is a fantastic company called Horn who produce the most amazing cabinets for sewing machines. The have a gas lift to raise your machine to working height, and press again to store away again into the cabinet. There are many options at various price points depending on your budget and available space. It’s also a good idea to look through some catalogues for inspiration and options. I ordered one from Jaycotts last weekend, OK my wish list grew, but it was helpful to have items listed side by side to compare sizes and features. Oh dear another LONG post, I really need to work on short n sweet rather than epic essays don’t I! Anyway I hope you find this post helpful, these are the tips I’ve picked up along the way and if they save you some time and money along the way, then its been worth the hard work looking up all these links.